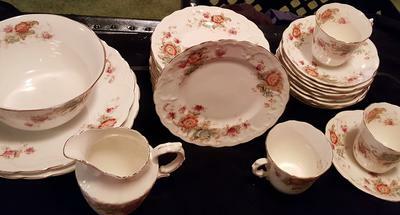 Hi my name is Kathleen Torkelson and recently i helped my nieghbor clean out her garage and in doing so she gave me this partial set of china. 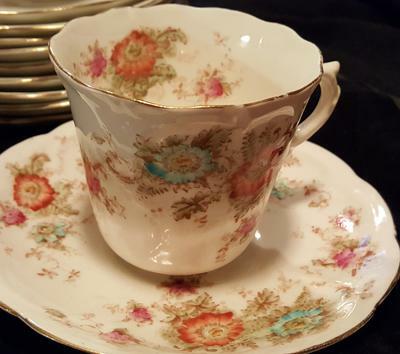 this is what she said," this was shipped over from England when her great grandmother move here to the states, and that these were her great grandmothers wedding gift." no i must tell you my nieghbor is 76 yrs old. 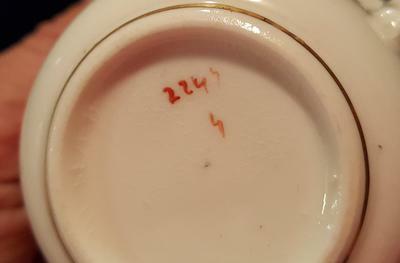 they are hand painted the ONLY marks are the numbers 2247 4 or2244 4 i cant tell, and only on 3 tea cups nowhere else. its very delicate and when you hold it to the light is transparent. i would like to sell these but i cant find any info on them any where. 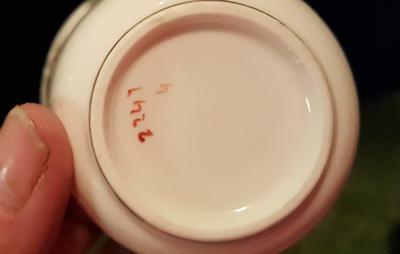 ive tried replacments ltd , ebay, and you guys so here hoping.